What Will It Take To Blow Up Pluto? "I love the smell of venting volatiles in the morning..."
The Pluto debate frustrates me, as you may have noticed. It’s not that I have particularly strong views about whether it should be called a planet or a dwarf planet or a plutoid or pygmy planetoid, it’s that I really don’t care; I actually see Pluto’s “demotion” as exciting progress in the field of Solar System science rather than any derogatory gesture aimed at Pluto. Pluto is still Pluto; it hasn’t been knocked out of orbit, it hasn’t even been “bombed” (unlike our poor old Moon), it’s just being filed under a different category. In my opinion, calling Pluto a “planet” was unworkable, especially after a bigger dwarf planet was discovered in 2005 by a team of astronomers led by Dr. Mike Brown. This dwarf planet was named Eris (or 136199 Eris) and at first it seemed like we had gained a tenth planet. The “ten planets” thing was short lived, however. In recognition that Eris probably represented the beginning of a spate of discoveries of welterweight worlds, the International Astronomical Union (IAU) took a vote in 2006 and decided to redefine what constitutes a planet. Pluto was in the firing line, became a rounding error and was dropped from the planetary club. Kicked out and nowhere to go. But it wasn’t all bad for the little guy. Pluto was designated king of all “plutoids” (trans-Neptunian dwarf planets) in 2008, meaning another three dwarf planets now orbited the Sun with this designation (Eris, Haumea, and Makemake in addition to Pluto). Just so my opinion is known, I don’t care what Pluto is called. If NASA decided to explode Pluto as part of a Kuiper belt clearing project, then yes, I might be a bit annoyed; I’d even start a blog titled “Save Pluto.” But calling Pluto a dwarf planet (or the rather cute plutino) really doesn’t bother me. To be honest, I’m astonished I haven’t thought of this before. Looking at Mike’s Twitter feed should have been enough inspiration, but until I wondered down the bombing Pluto => plutonium enrichment => lets fly a shedload of plutonium to Pluto path, that I asked the question: How much energy is needed to completely destroy Pluto? Now we’re talking! Time for some Kuiper belt mayhem! I’m not talking about simply bombing Pluto and making a big crater, I’m not even talking about fire bombing all the volatiles out of its frozen surface, I want to remove Pluto from existence. Why do I want to do this? Well, for fun, and because @PlutoKiller himself said so. And it’s Halloween, so why not? So how much energy is required to do this? For this gargantuan task, I cheated and looked up the method used by Matt Springer over at Built on Facts to derive how much energy was required by the Star Wars Death Star to shred Earth. In that case, 2.2 × 1032 Joules was needed to totally erase our planet (that’s a week’s-worth of solar output). That’s a lot, right? Oops, who put those WMDs there? But what does this number mean? This is the bare minimum energy required to match the gravitational binding energy of Pluto. 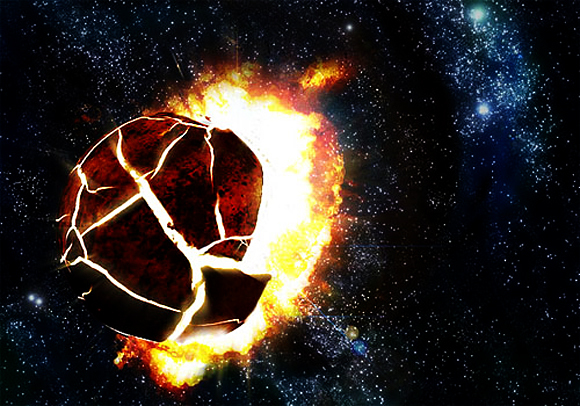 If you want to rip the dwarf planet apart (plus pyrotechnics and speeding debris), you’ll need a lot more energy. However, nearly 6×1027 Joules (that’s a 6 followed by 27 zeros) delivered into Pluto in one second should give the little world a very bad day. But how can we “deliver” this vast quantity of energy in one second? I suspect that any super-advanced civilization hell-bent of wiping out planets will have a better idea of this than me, but using weapons that are available to modern man might be a good place to start. Forget the uber-powerful death ray emitted by the Death Star, that’s sci-fi. It may not be sci-fact, but how about sending some nuclear bombs to the Kuiper belt? How many bombs will we need? Ten? Ten dozen? A thousand? The most powerful nuclear weapon tested was the Soviet 58 MT Tsar Bomba in 1961. So if we know how much energy is released by one of those beasts, we should be able to work out how many we’ll need to send to the unsuspecting Pluto. We needed 6×1027 Joules to wipe out Pluto, obviously the 2.4×1017 Joules a single bomb can deliver is woefully short of our goal. So how many Tsar Bomba weapons do we need? We need to build 25,000,000,000 nuclear bombs. 25 billion. Ouch. Obviously, looking at this estimation, it is impossible to destroy a dwarf planet as puny as Pluto using the most powerful weapon known to man. Also, it’s worth keeping in mind that this is the bare minimum of energy that needs to be applied to Pluto to match its gravitational binding energy, so to destroy it, you’ll need a lot more bombs. There’s also the question of how to distribute the weapons. Would you put them all in one place? Distribute them all around the globe? Perhaps burrow into the centre of the body? I suppose putting all the bombs in one place might be impressive, kicking a chunk of plutoid into space. Author Ian O'NeillPosted on October 30, 2009 Categories Featured Articles, Humour, Solar SystemTags Dwarf Planet, Eris, Mike Brown, Nuclear weapons, Pluto, Pluto killer15 Comments on What Will It Take To Blow Up Pluto? Is Pluto Affected by the Pioneer Anomaly? The Pioneer Effect is a mysterious observation of a number of man-made probes that venture through and beyond the Solar System. Originally noticed in the slight drift of the Pioneer 10 and Pioneer 11 spacecraft (launched in 1972 and 1973) from their calculated trajectories, scientists have been at a loss to explain the tiny, yet constant, extra-sunward acceleration. Some theories suggest that invisible clouds of dark matter are slowing these probes down, causing them to be influenced by the Sun’s gravity more than expected. Other suggestions include ideas that Einstein’s theory of General Relativity needs to be tweaked when considering interplanetary distances. However, there are other, more mundane ideas. Perhaps there is a tiny fuel leak in the probes’ mechanics, or the distribution of heat through the spacecraft is causing a preferential release of infrared photons from one side, nudging them off course. Finding an answer to the Pioneer effect probably won’t surface any time soon, but it is an enduring mystery that could have a comparatively simple explanation, within the realms of known science, but there’s also the possibility that we could also be looking at some entirely new physics. In an attempt to single out whether the Pioneer anomaly is an artefact with the spaceships themselves, or unknown in the physics of the Universe, astronomers decided to analyse the orbits of the planets in the outer Solar System. The rationale being that if this is a large-scale influence, some observable periodic effects should be evident in the orbit of Pluto. So far, no effect, periodic or otherwise, has been observed in the orbit of Pluto. If the effect isn’t big enough to influence Pluto, does this mean we can narrow the search down to spaceship-specific artefacts? Gary Page and John Wallin from George Mason University in Virginia and David Dixon from Jornada Observatory in New Mexico, have published a paper pointing out that the suggestion that the Pioneer effect doesn’t influence Pluto is flawed. Pluto’s orbit is far less understood than the orbits of the inner Solar System planets, as, let’s face it, Pluto is far away. We simply don’t possess the data required to cancel out the Pioneer effect on planetary bodies in the outer-Solar System to reach the conclusion the anomaly doesn’t influence Pluto. Author Ian O'NeillPosted on May 7, 2009 March 8, 2017 Categories Featured Articles, Solar System, Space FlightTags Dark Matter, Einstein, General Relativity, Pioneer 10, Pioneer 11, Pioneer anomaly, Pioneer effect, Pluto4 Comments on Is Pluto Affected by the Pioneer Anomaly? I can’t emphasise enough how much I love this short film. It may only be 13 minutes long, but it is as small as it is mighty, much like the dwarf planet itself. 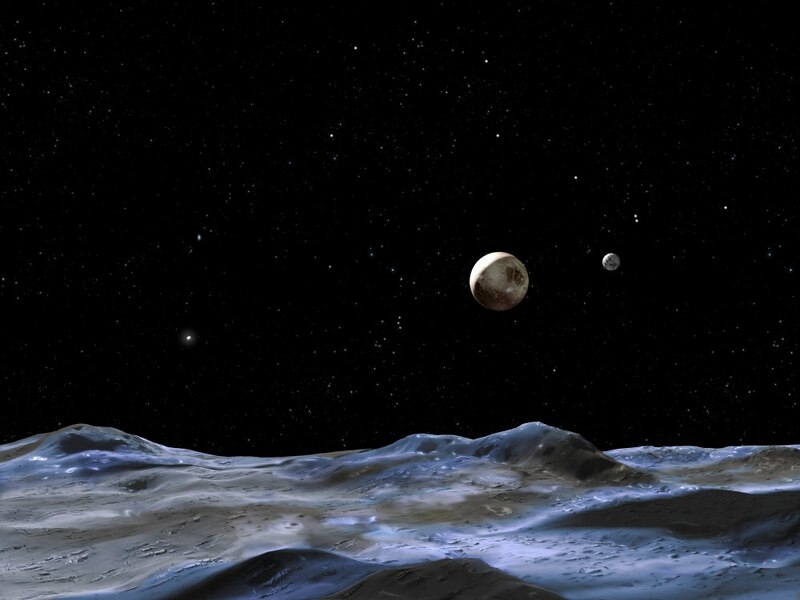 “Naming Pluto” documents the adventure of how Pluto got its name. Inevitably with most astronomical studies, there can be some controversy surrounding the naming of celestial objects, often depending on traditional naming protocol and who made the discovery first. The naming of Pluto on the other hand appears to take on a more natural tact, starting with a conversation in 1930 involving a little girl named Venetia Phair and her grandfather, over breakfast in Oxfordshire. Father Films have just released a trailer for their magnificent film, giving you a taster as to what to expect. I had the pleasure of watching and reviewing a copy late last year, and I was blown away by the accuracy, wonder and history that can be packed into 13 minutes (note that the DVD has extras included, extending the content to 40 minutes). I fell in love with Pluto all over again – suddenly the fact that the IAU had demoted the planet to a dwarf planet (and then to a plutoid) didn’t matter any more. 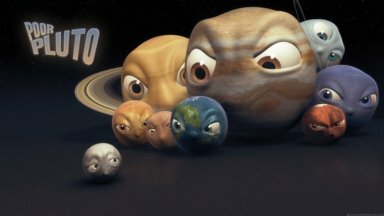 Written, directed and produced by Ginita Jimenez, Naming Pluto is in the true spirit of the International Year of Astronomy, capturing the excitement surrounding a tiny member of the Solar System with excellence. I wholeheartedly recommend this short film, it needs to be in your DVD collection! Patrick Moore is also at his best, giving the proceeds his unique style. And don’t just take it from me, Astronomy Now has also given the film a highly enthusiastic review. You can purchase a copy of the DVD and poster from the Father Films website. For more, check out my reviews of Naming Pluto on the Universe Today and Astroengine.com. Could the dwarf planet Ceres maintain life? Possibly, says a scientist from a German university. According to new research, this ex-asteroid (who did a deal with the IAU to sell out Pluto, trading in its asteroid status to become a dwarf planet, at the expense of Pluto being demoted from being a planet. Obviously) may have harboured microbial life near geothermal vents in hypothetical liquid oceans (I emphasise hypothetical). Not only that, but Ceres’ chilly microbes could have been kicked into space by meteorites, spreading life throughout the Solar System. Forget Mars (you’re looking too hard), forget Europa (a moon? With life? Pah), the new giver of life could be Ceres, the dwarf planet we know next to nothing about. Then there’s Pluto. Not much chance of life there either (although it would be fun to speculate, there is methane there after all), but the hard-done-by newly-christened dwarf planet has a rather bizarre atmosphere. Its temperature profile is upside down. Oh, and Pluto has just been reunited with its planetary status… in Illinois only (because a governor really does know more about planets than 400 members of the International Astronomical Union).